p1 celphone | Badudets Everything Nice! 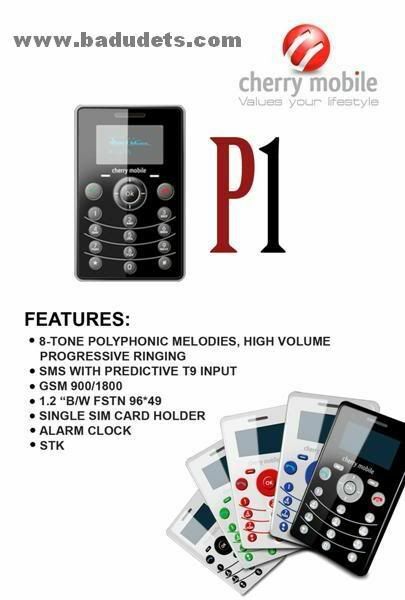 Cherry Mobile P1, I want! I want a Cherry Mobile P1! Cherry Mobile is a new player in the mobile phone market, its edge is offering affordable dual-sim phones, no wonder it has became popular in a just short period of time. If you’re intrigued on how this phone looks like, it’s very small and has different colors. It looks like more of an MP3 player than a mobile phone. The reason why I want it so bad is because it’s only Php 999. Yep, nine-hundred-ninety-nine!